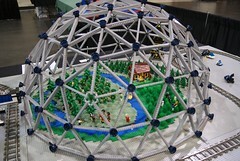 This is a picture of Todd Thuma's Biosphere from last year -- it's a copied design, but it's still very impressive! Very retro 80's. I think of Bio-Dome every time I look at it.